When to use: When you are bullish to very bullish on the market. 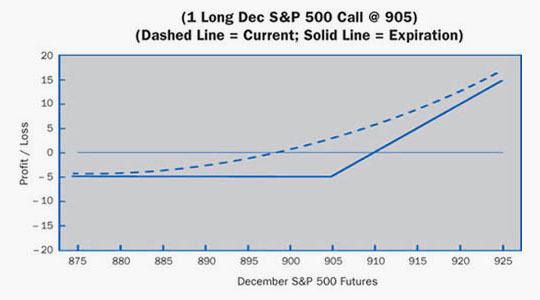 In general, the more out-of-the-money (higher strike) calls, the more bullish the strategy. Profit characteristics: Profit increases as market rises. At expiration, break-even point will be call option exercise price A+ price paid for call option. Loss characteristics: Loss limited to amount paid for option. Maximum loss realized if market ends below option exercise A. A trader projects that stock market futures are poised for a large upward move in a short period of time. An increase in the underlying futures to 1315.00 or greater, and an increase in implied volatility by 4 percentage points, also seem likely. Consequently, the trader decides to buy a call. Loss Risk: Below 910.40; with maximum loss, at 905 or below, of 5.40. Potential Gain: Unlimited; profits continue to increase as futures rise above 910.40. The trader will lose the volatility effect if this position is held to expiration. As soon as implied volatility rises to the expected level the trader may consider liquidating or transforming this position. Check the next page for appropriate follow-up strategies.